You're probably familiar with Make-Up Designory for their highly regarded schools in New York & LA, but you might not have known they also have their own line of cosmetics available. They offer a selection of products for the face, eyes, cheeks, lips, as well as tools, palettes, brushes, & accessories. MUD promises quality, long-lasting, flawless application and radiant accurate color cosmetics, and that's what you'll get! I wanted to review MUD, because they're the real deal. No hype, no new collections every week, no slick marketing gimmick's...just truly functional, performance based Make Up Artist QUALITY cosmetics. The Leading Lady Makeup Kit ($29.95) is made up of perfect coordinating shades to create a classic Retro Hollywood "Leading Lady" look. The kit contains a customizable MUD quad with 4 eyeshadow pans in Apricot, Taupe, Expresso, and Honeysuckle. The shadows are velvety smooth, pigmented, and blend like a dream. Taupe & Espresso also make fabulous brow powders. These are some of the best matte eyeshadow's that I have in my kit. I'm not sure if this set is still available, but the eyeshadow's & lipstick are available for purchase separately. They offer refill pans for $10. I'm slowly replacing my MAC pan's with them, such great quality for the price. Lady Bug Lipstick is a girl's best friend, aka the perfect Red Lipstick. The satin formula is rich & emollient leaving lips with a smooth matte finish. The color is an intense tomato red with slight blue undertone. Basically, if MAC Russian Red & Ruby Woo had a cremesheen baby this would be it. 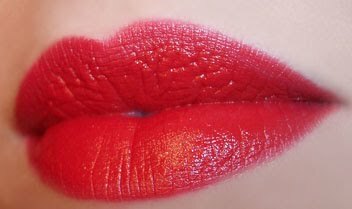 This has become one of my absolute favorite red lipstick's. It looks luscious on, I'm already on my 2nd. tube! I also recommend checking out their brushes! I have a few and they're phenomenal quality. 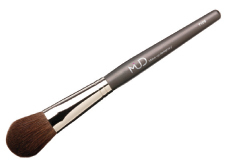 Definitely worth investing in if you're looking for high-quality professional makeup brushes. MUD Cosmetics is available at mudshop, select store locations, or visit their stores in New York & LA. Above review contains a sample provided for review consideration and products I purchased myself.